This blog discusses quick and easy steps to enable Intel VT-x or AMD-V in your Windows 10 and Windows 8 operating system. Intel VT-x or AMD-V featured processors allow you to run virtual environment such as Virtual machines, mobile phone emulators(If you want to develop mobile applications in Microsoft Visual Studio) etc. What is Intel VT-x and AMD-V? Intel VT-x and AMD-V are processors manufactured by Intel and AMD Corp. that support virtualization. Not all the processors manufactured by Intel or AMD will have Intel VT-x and AMD-V. So, if you plan to purchase a new processor, please check the official processor specification page to see if supports Virtualization. 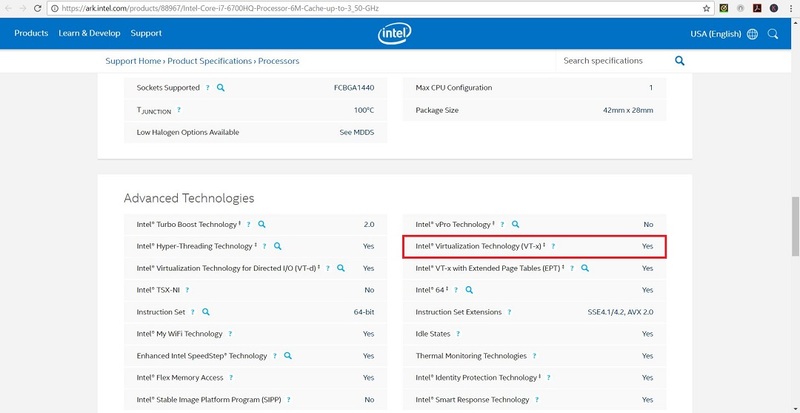 For example, to check if Intel 6800HQ processor supports Virtualization, you can visit the official Intel 6800HQ product specification page and search for Intel® Virtualization Technology (VT-x). If you see yes, the processor supports Virtualization. Below is the screenshot of the specification page for the Intel 6800HQ processor. For Intel, to go to the Processor specification page, Google search with the name of the processor. Most of the time first or the second search result will be the official processor specification page. For AMD, the product specification page is difficult to find. If you Google search for AMD processor, you will see many pages other than AMD official documentation page. Click on a couple of pages that provide Specification and look for Hardware Virtualization. If it says yes, it mean that it supports Virtualization. 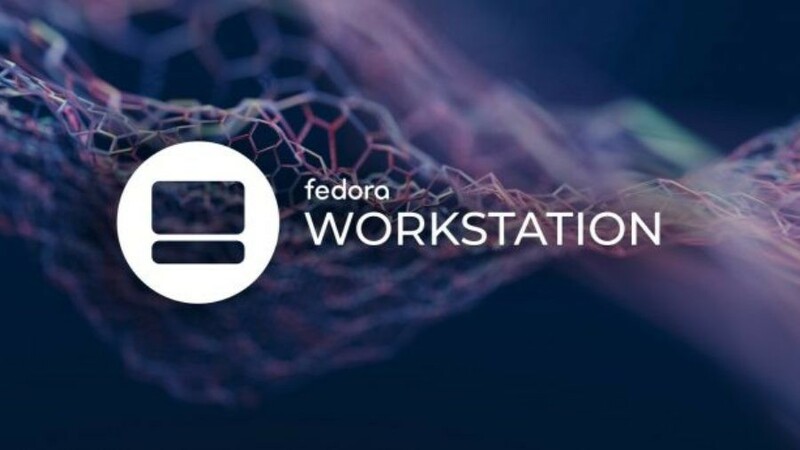 Do you need Intel VT-x or AMD-V processor for Virtualization? The answer is Yes if you want to run 64 bit operating system. For 32 bit operating system, Intel VT-x or AMD-V is not required. But, in my experience processors without Intel VT-x or AMD-V give poor performance and the systems slows down. So it is highly recommended to have processors that support Virtualization. Besides this, Microsoft Hyper-V, which is available for free in Windows pro and above versions requires Intel VT or AMD-V. Without this, you wont be able to use Hyper-V.
Do you have to enable Intel VT-x or AMD-V in BIOS or UEFI? Most processors these days have Virtualization support. In AMD-V processors, you don’t have to enable them in BIOS because they are enabled by default. In AMD processors you might not even see any option to enable or disable virtualization. For Intel processors, most of the time Intel VT-x is disabled by default. To use Intel VT you will have to enable it in BIOS. 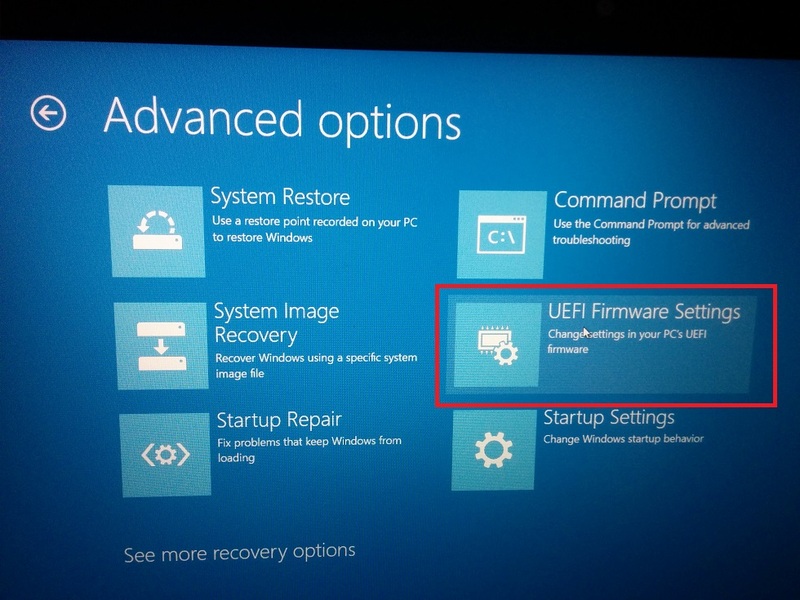 How to enable Intel VT-x in UEFI? Almost all of the modern laptops have UEFI instead of BIOS. BIOS is not completed removed but is now termed as legacy BIOS. There is no need to boot into BIOS Utility to change BIOS settings. Booting to BIOS Utility is confusing and often tricky. 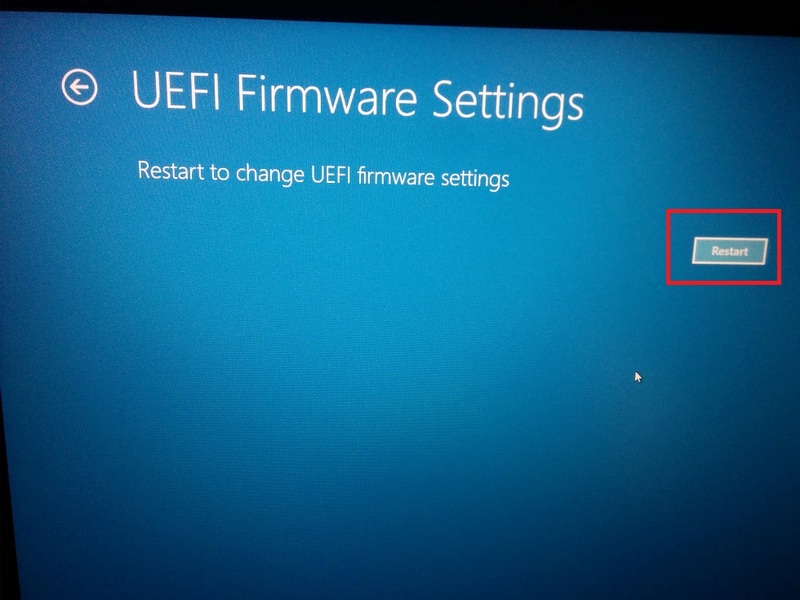 But with UEFI, it is very simple. Lets see how it is done in Windows 10. For Windows 8, Swipe from the right to open the charms bar. Tap or click Change PC settings. 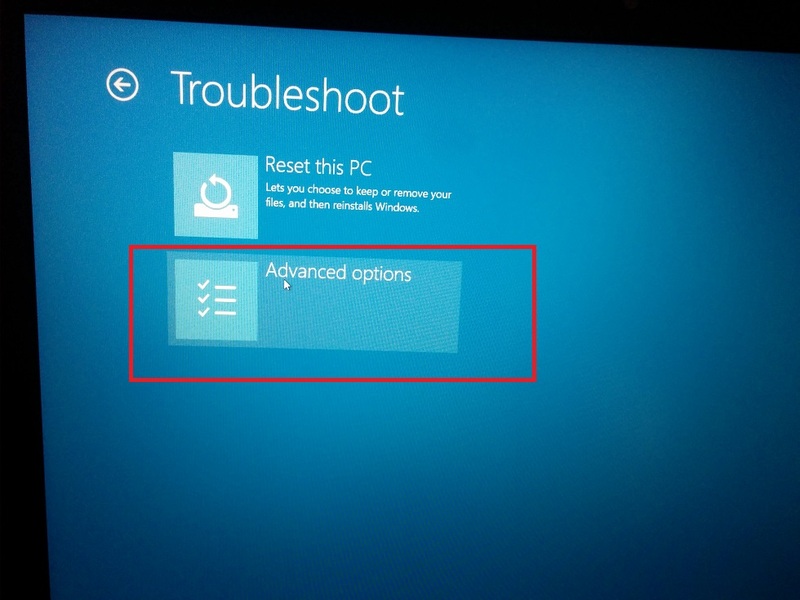 Choose Update and recovery from the list on the left (or General prior to Windows 8.1), then choose Recovery. Locate Advanced startup, at the bottom of the list of options on your right. Tap or click on Restart now. Wait through the Please wait message until Advanced Startup Options opens. 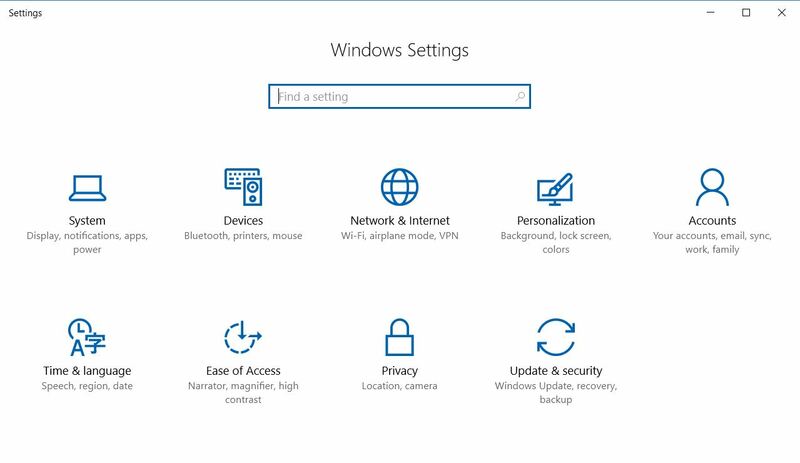 From here go to Step 3. process is the same for Windows 10 and Windows 8. 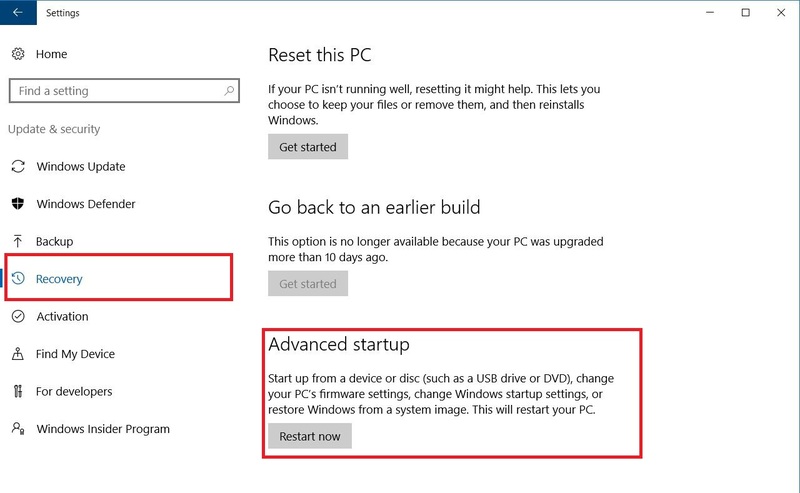 Click on Recovery on the left pane and under Advanced Startup, click on restart now as shown below in the screenshot. 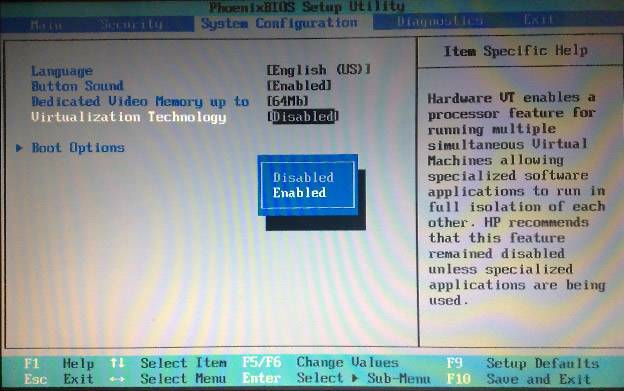 In BIOS change the settings from Disabled to Enable for Intel Virtualization Technology. After changing the value from Disable to Enable, press F10 (or whatever is the option for your system. Look in the side or at the bottom to find the key to save and restart for your system) to save and restart. That’s it you are done. How to Enable Intel VT-x in BIOS? BIOS has a setup utility that allows you to set or unset a particular property. For example, most common is to boot from CD ROM first which in most of the cases is set to boot from HDD (Hard Drive). You cannot enter BIOS Utility when you have already booted into windows or Linux OS. 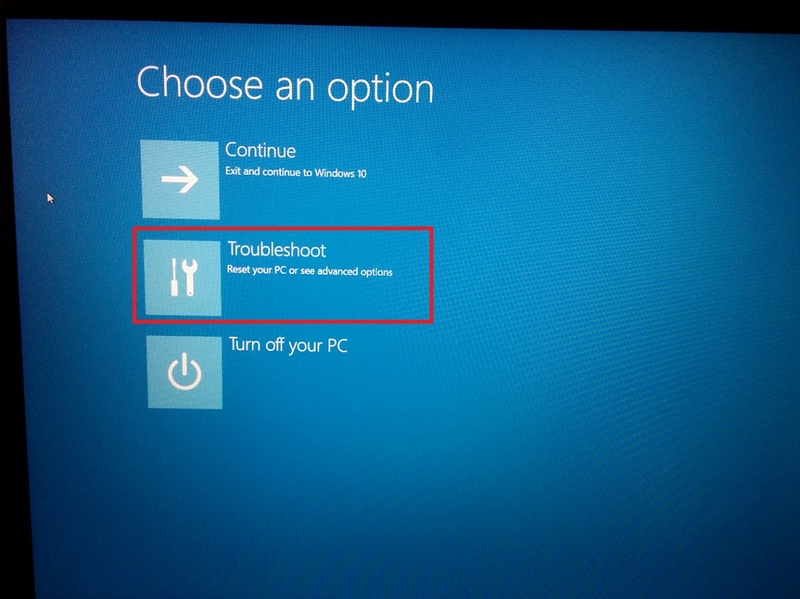 You will have to restart your computer and there are is a combination of key strokes that you will have to press after the computer powers on but before it begins to boot from HDD or CD ROM. You will have to be very quick after you power on your computer, else, the computer will begin to boot from HDD. In that case, shout down or restart your system and try again. Unfortunately, every motherboard manufacturer or laptop manufacturer will have a different key combinations of entering into BIOS Utility. This you will have to find out by searching Google and typing Keywords like How to enter BIOS in MSI. Here instead of MSI, it could be Sony, HP, Lenovo etc.. based on your laptop or desktop. Then ready through a couple of suggested pages and you will get the answer. 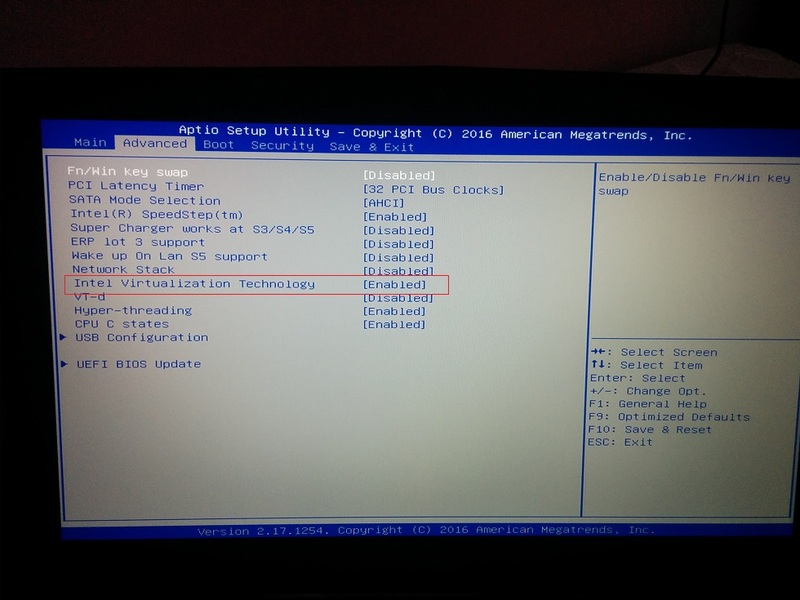 After you have entered BIOS setup Utility, using the arrow keys, look for Virtualization Technology which should mostly likely be in System Configuration Tab or Advanced Chipset settings. This will change depending on the manufacturer. In any case look for Virtualization Technology. Use the arrow keys to Change from Disable to Enable. You then have to save and exit. In most of the cases, you will have to press F10 to save and exit. But it can vary. Look at the bottom of the BIOS Utility screen, you will see the key which saves and exists. That’s it. You are done. VT is enabled. That’s it in this post. If you have any questions, please leave a comment below. I will reply. Thanks. You are a life-saver!! Thank you very much for this tutorial!! It was really helpful for me!!! You have no idea how much this means!! Thanks!! Thank you very much for this tutorial!! You are a life-saver!! You have no idea how much this has helped me!! Thanks!! 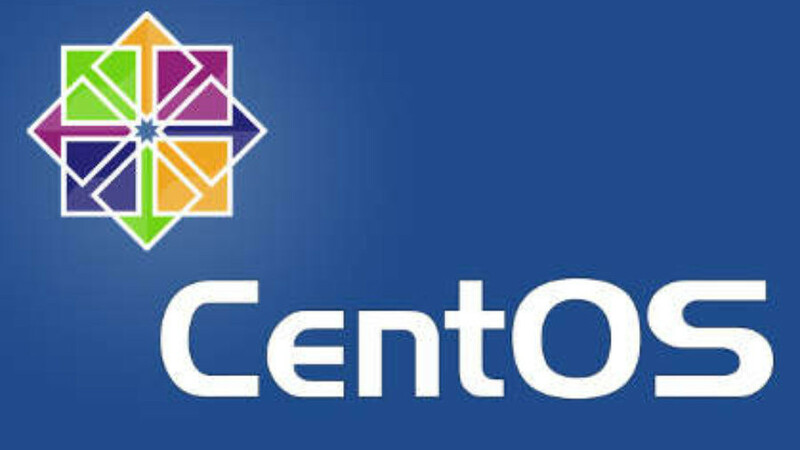 i need to run vm ware what should i do? Intel Virtualisation is required to run 64 bit OS and not for 32 bit OS. Without Intel Virtualisation you can still use 32 bit OS. So go ahead and use 32 bit version of the OS you want to install as a virtual machine. Didn’t work. I had already set the BIOS, it seems I need to do something in addition, and that’s what I hoped to find. Thanks..
Hyper-V is not compatible with VMware and Virtualbox. You can either have Hyper-V or VMware/VirtualBox but not both. Problem with me is that Docker for windows runs only in Hyper-V if I want to use Linux containers. For all the other VM’s I use VMware. I keep all the three on my laptop – Hyper-V, VMware, VirtualBox. If I want to switch to Hyper-V, I enable it by entering the following command as an administrator and restart. THANK YOU!! !THANK YOU!!THANKYOU!!!! I have been trying for an entire month to figure this out. I came upon your blog purely by accident. You have given me a very simple solution to my issue and walked me through the steps without making me feel like an idiot! Thank you. Thanks a lot for your lovely comment and appreciation.